Manage and integrate photos with your website. Is there a better alternative to JumpBox for Gallery Photo Management? Is JumpBox for Gallery Photo Management really the best app in File Management category? Will JumpBox for Gallery Photo Management work good on macOS 10.13.4? 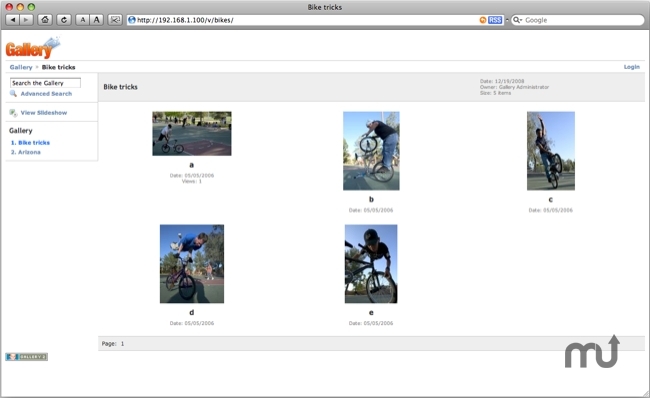 JumpBox for Gallery Photo Management ... Gallery helps you manage and integrate photos with your website. Create unlimited photo albums then store and share them easily using features such RSS, commenting, and email notification. The JumpBox for Gallery helps you get started managing your photos and movies in minutes. Benefits of running a JumpBox Deploying an application as a JumpBox provides a dramatically-reduced path to getting started with the software. Aside from installation benefits it yields other advantages such as portability across computing environments and simplified ongoing maintenance of the application. Version 1.7.3: Release notes were unavailable when this listing was updated. JumpBox for Gallery Photo Management needs a review. Be the first to review this app and get the discussion started! JumpBox for Gallery Photo Management needs a rating. Be the first to rate this app and get the discussion started! Mac-like usability for server applications that typically require command-line interaction and complicated setup scripts. Self-contained deployment means it's easy to move or delete - it won't scatter files all over your Mac's file system. Runs equally well under Parallels or VMware Fusion on OSX. Use the snapshotting features of your virtualization software to experiment fearlessly with your JumpBox without danger of breaking the application irreparably.